This is a small tour of our garden just to show what has been achieved during about five years time. It is situated south of Gothenburg Sweden and is said to be included in growth zone 2 which is the next best one according to variuos books and magazines. Let´s start at the front of the house with the largest renovated bed. This is a direct south direction with lots of sunlight and here we also have two fruit trees, a so called "family" apple tree (a tree with four different sorts of apples to secure pollination) and a plum tree. The idea is that they should provide good fruit in the autumn - the only snag is to be faster to pick them than the deer and moose. On the picture above it is hard to believe that there were four over-grown "dwarf"-pines, four equally over-grown spireas, and squeezed-in a few skinny lily´s. The picture is from 2008 and shows something completely differnt. A few of the spireas are still there but after being trimmed at ground level they have come up to be more adequate some years later. Continuing round the corner we get to the latest bed. The large stone to the left has been moved to the place we want it and the whole part of this will be more developed in the coming years. The small section of stone wall is original from the site as it was forest grasing land before villas and gardens. We think that the stone wall fits in just perfectly into whole the picture. Continuing further into the garden the lawn appears with surrounding flower beds etcetera. 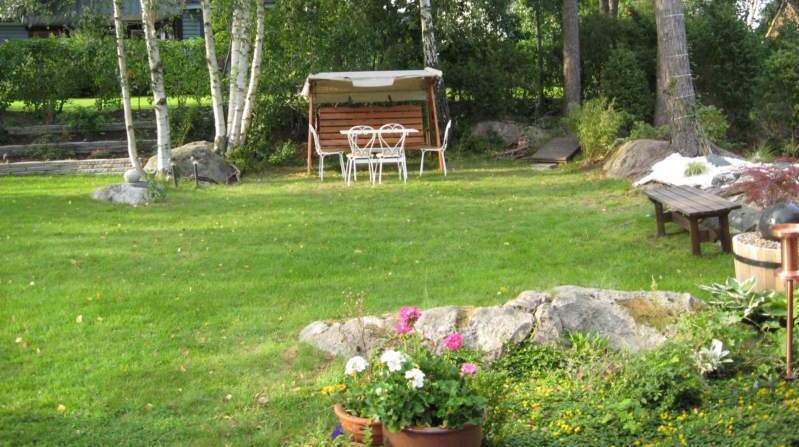 The bed behind the hammock is nowadays renovated in the same manner as the one to the left of the birch trees. We made it terraced as the neighboring lot is about one meter higher than ours. The terraces are very good for flowers, especially shadow-loving plats of all sorts. In the foreground we see one of the flower beds destined for renovation during next year. 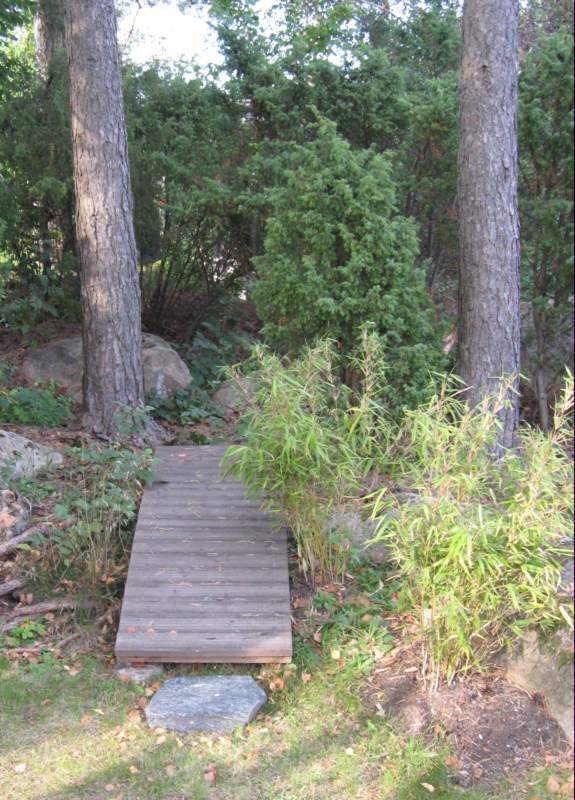 Just to the right of the hammock there is a small japanese inspired bridge leading into a small forest pathway. The bridge is there to spare the roots which are very close to surface and I wanted to avoid un-necessary damage to them so the bridge works fine for that. Having turned the camera a little more to the right we can see the white gravel-surfaced part which is an attempt to create a small japanese-like garden. Successful? Well, quite OK for me. If we go over the bridge into the forest path the solution is better shown. The bridge itself rests on a large stone in each corner, but is otherwise loose. Works very well for both man and wild-life (both deer and moose have passed without problems. When the picture was taken, the bamboos were very newly planted. Toady in 2012 they are completely grown together and fills the space very nicely, just as desired. 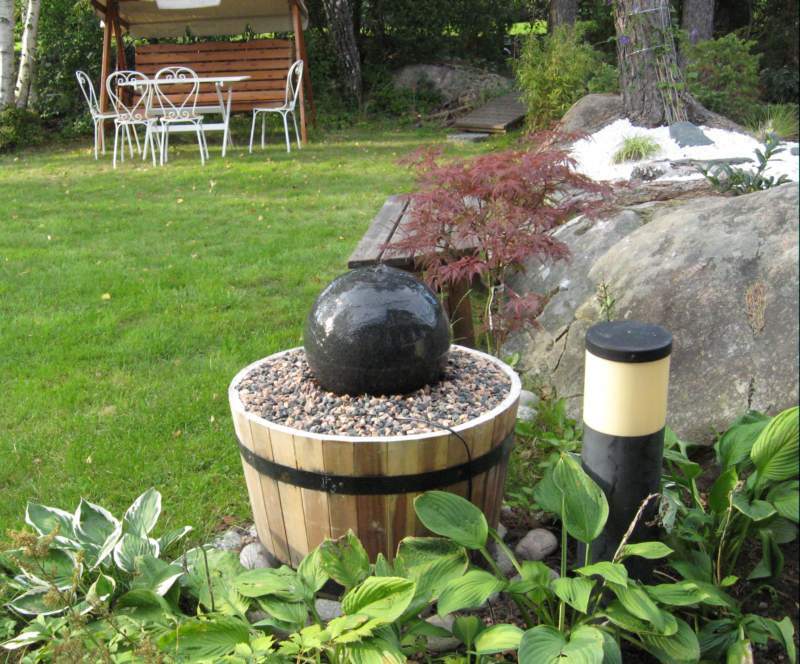 On the left side we have planted a selection of different ferns and a Lady´s Mantle that fills the space nicely. Next picture is taken from the forest path onto the japanese like garden section. It also shows the great difference in view we get with the perspective. I think it also shows how easy it is to create "rooms" in a garden to get many interesting views. The white (marble) gravel section looks better from this angle (and from within the house) than from the lawn. The black rocks glittering with gold (just fools gold) comes from a building site nearby saved from the diggers. 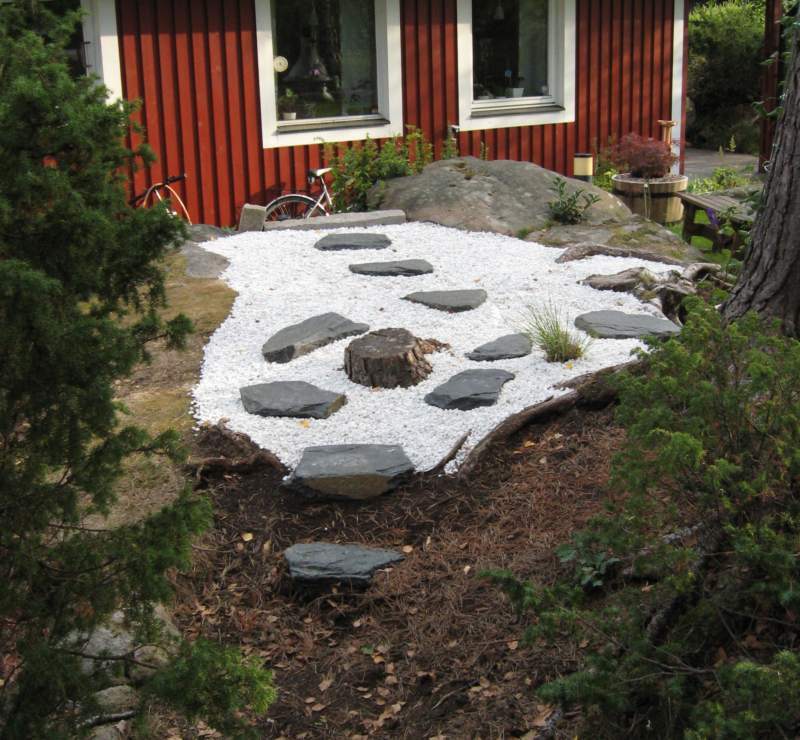 Here they work better as stepping stones in the white gravel. The last picture of the tour is on the little water foutain and the bench. The fountain provides a calming sound and the bench is the perfect place for a not so quick cup of coffea in the afternoon. Same picture as the one in the page header but a little larger in size. With this picture, the tour ends.